Seven children were born to Alexander Clark Wallace and Sophronia Jane Steed, four of whom were born in NC and three in KY. (from Allen Wallace's work). 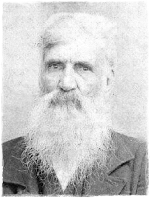 Alexander Clark and family, along with two of his brothers and their families and others, traveled by covered wagon to KY probably in the spring of 1868 (see notes listed with Erasmus Stimpson Wallace). In one of the wagons was a dresser that now is in the possession of Lewis Edward Wallace, a great-grandson of Alexander Clark Wallace. On the Back of one of the dresser drawers are clearly written the initials A.C.W., S.J.W., J.R.W., C.C.W., A.J.W., C.E.W., E.M.W., L.J.W., AND L.E.R.B.W. These are the initials of Alexander Clark Wallace, Sophronia Jane Wallace, and their seven children listed in order of their age.